The new-look Brooklyn Nets are set to unveil their new uniforms sometime tomorrow, but the look already has been outed. The road uniform designs were leaked earlier this week and now, at NBA 2K13's star-studded launch party in New York last night, we can see the home threads. I mean, we should have expected this, right? Jay-Z, a minority owner of the team (a very, very minority owner of the team, apparently) is the game's executive producer. And Jay himself spilled the beans on holding that gig about a day before everyone was ready for the announcement. Anyway, below you can also see the Nets in the game's new introduction sequence, which is where you see most of Jay-Z's production influence. 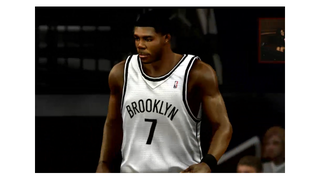 You knew the Nets were going to get a ton of love in this cinematic. NBA 2K13 is on shelves on Tuesday.